If you ask me, neither upgrade is all too likely – Apple usually reserves resolution bumps for the solely-numbered models. Currently, the two phones are at a 4.7-inch, 1,334 x 750-pixel display and a 5.5-inch, 1,920 x 1,080-pixel screen, respectively. Both are LED panels with IPS technology for wide viewing angles. 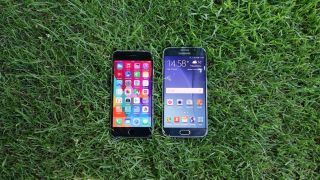 The Samsung Galaxy S6 houses a 5.1-inch, 1,440 x 2,560-pixel Super AMOLED display, which has even the most optimistic iPhone 6S beat regardless – at least on paper. You'll find an essentially identical screen within the Galaxy Note 5, only larger at 5.7 inches. If the iPhone 6S Plus manages to come out with that 2K display, it will be the first time in recent memory a Samsung and Apple flagship phone were equally matched in pixel count. Given the likely difference in pixel count and battery size between these rival phones, it's likely that they'll meet in a stalemate once more in this round of the bout – with Samsung probably eking out on to, but not by much. That is, unless Apple somehow managed to apply its newfangled battery folding tech found in its New MacBook to the iPhone. That said, it's clear that Samsung will remain ahead of Apple in some regards, at least on paper, namely screen and camera resolution – unless Apple uncharacteristically pumps up the pixels this year. But everyone knows that it's the finer details regarding each phone that will decide this round in the endless boxing match these two juggernauts. How the iPhone 6S camera stacks up to the Samsung's seriously souped up shooters will be particularly interesting this year. Better grab the popcorn – this fight ought to be a treat. Now what about that Samsung Galaxy S6 Edge+?